We Prashant Engineering manufacturer of UPVC Clamp. In order to meet the particular choices of our valued customers, our firm is affianced in offering a commendable array of UPVC 45 Degree Elbow. 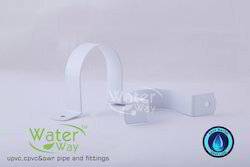 Precisely designed, this pipe is generally used during sanitary fitting in homes, hotels, shopping malls, offices, etc. Sourced from the renowned vendors of the industry, this pipe is appreciated for its striking attributes. Price: Rs 5 to Rs 100. The UPVC U Clamps are extensively bused by the clients for its vast area of applications. We manufacture these UPVC U Clamps by using high grade material as per the set industrial standards and parameters. We are devoted towards offering the qualitative range of UPVC Clamp, as per client’s precise need and requirements. Being a prominent organization, we are instrumental in providing our valued clients with a wide assortment of UPVC Conduit Clamp.